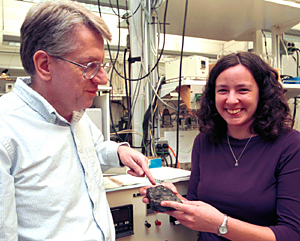 David Kilper/WUSTL PhotoBruce Fegley, Jr. and Laura Schaefer, with a chunk of galena, or lead sulfide.Lead sulfide — also known by its mineral name, galena — is a naturally occurring mineral found in Missouri, other parts of the world, and now. . .other parts of the solar system. Because recent thermodynamic calculations by researchers at Washington University in St. Louis provide plausible evidence that "heavy metal snow," which blankets the surface of upper altitude Venusian rocks, is composed of both lead and bismuth sulfides.